Vietnam is a place of brilliant colors and vivid impressions – lush green hills, jagged karst peaks, turquoise waters, red lacquered pillars, golden buddhas. Westerners often think of Vietnam in terms of the Vietnam War, but the country itself was shaped by a long, rich history of empire and conquest, undergoing 1000 years of Chinese occupation, another 1000 years of Viet dynasties, nearly 70 years as a French colony, and ten years as an independent Communist nation before that war began. Since the war ended, the people of Vietnam have put their separations and devastations behind them and focused on building a competitive modern economy. Stretching almost 1200 miles in length, Vietnam contains a wide variety of terrain and weather zones, and is culturally, geographically and ecologically diverse as a result. In the mountains of the North, ethnic minorities still wear their traditional, brightly embroidered costumes, speak their own languages and produce their traditional crafts. Halong Bay’s misty, craggy islands seem like a dreamscape, especially when you view them from aboard a traditional Chinese junk. Hanoi, the current capital, buzzes with industry and entrepreneurial spirit, but its ancient past is evident in the narrow streets of the Old Quarter and the tranquil gardens of the Temple of Literature. Hanoi’s elegant mansions evoke the French Colonial period, while the stark grandioslty of Ho Chi Minh's mausoleum and museum reminds you of the ongoing Communist regime. Central Vietnam features sandy, palm-fringed beaches and historic gems. Hue, the Ancient Imperial capital and a current center of education and culture, is largely untouched by development, with palaces, tombs and pagodas that recall the grandeur and dignity of the emperors. Hoi An’s well-preserved Old Quarter shows a unique mix of architectural styles, the result of centuries of international trade. Occupied by American troops during the war, the South seems less exotic and more Western than other areas of Vietnam. Saigon (Ho Chi Minh City) is an important commercial hub, but has lost much of its uniqueness and charm to development. However, it still boasts some of the finest cuisine in the country. The Mekong Delta is the country’s “rice bowl,” where emerald-green rice fields stretch for miles, and life and industry is centered around the waterways. These pages highlight the best of Central and Northern Vietnam, but there are plenty of other worthwhile destinations throughout the country, including the beaches and reefs of Phu Quoc and Nha Trang and the picturesque hill station of Dalat. 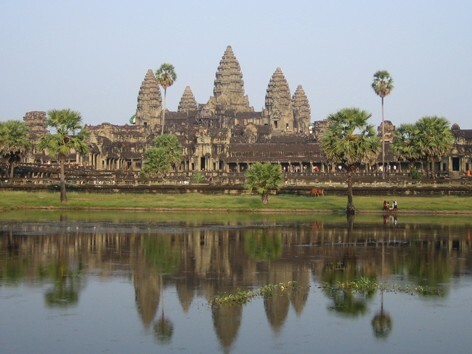 In neighboring Cambodia, the famed Khmer temples of Angkor are an easy and memorable addition to a Vietnam itinerary (we feature it as a trip extension). Whether you come here for festivals, cuisine, history or landscapes, you’ll find fascinating experiences and warm, friendly people everywhere you go.